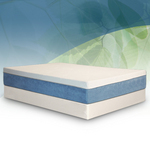 The Tranquility GEL with Natural TENCEL Memory Foam Mattress has a medium/firm feel, but allows the memory foam to quickly conform to your body for pressure relief and support without sinking into the mattress too far. TENCEL fabric is made from Eucalyptus trees utilizing a environmentally sustainable process, which makes this cover environmentally friendly. The cover offers unique moisture management properties, it's designed to be ultra soft for sensitive skin as well as naturally inhibiting bacterial growth. 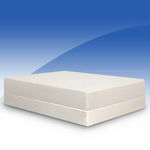 Underneath the cover is a 3 inch layer of memory foam along with an 8 inch layer of high resiliency support foam for soft comfort and long lasting durability. 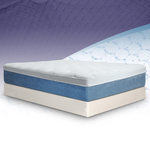 The overall height of the mattress is 11 inches tall. 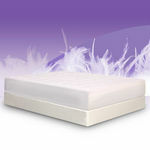 Feels like your sleeping on a cloud with good support! Only complaint I have is maybe it's to soft! I absolutely love this mattress!! When I need a new one, I plan on getting one exactly like this!! It's amazing! I tell all my family and friends they NEED one too!! This mattress is truly unique from other mattresses I have owned in my life time.The body weight support is out of this world.When your laying on this mattress you feel like your on a perfectly balanced cloud of a mattress.The mattress has temperature control great for someone like me that suffers from hot flashes.I am so happy I decided to get rid of my old mattress now I am really getting the type of sleep I deserve. Okay so we recently just got done adding and re-doing a lot to our house inside and out. One of the main things I concentrated on was an extra room we had that was originally going to be a bedroom, but we never got around to figuring out what to do. Unfortunately my mom recently became sick and has been staying here for long periods of time so we figured best time to fix up that room into a guest room. 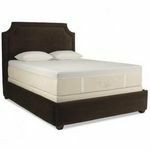 One of my main worries was a good mattress for that room and I didn't really know where to start because the bed I use was extremely expensive and we didn't want to spend as much as that mattress for a guest room, but still wanted a good quality long lasting bed. I kept hearing around about bedinabox.com and had no idea what it was, but from the name was very skeptical. To me it sounded like a thin, small, rolled up mat. 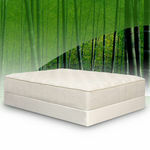 Then I went to their website and seen they actually are pretty decent mattresses with a lot of options to choose from. We decided we were going to give it a try given that there's a 60 day guarantee no cost return policy. Their customer service was pretty good with giving me information of what they thought would be good so we decided to go with the tranquility gel with natural tencel memory foam because both my mom and I have bad backs and it seemed like that would be most supportive. I was a little disappointed with the price because it did run around 1000 dollars, but compared to the price of my primary bed we figured maybe it wasn't too bad. 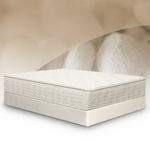 We did receieve the mattress fast like they promised and it was fairly easy to get it together. So I decided before my mom used it I would try it out for a week. It's a pretty good mattress, but not the best. I feel like I needed an extra pillow top because it was very firm. It did have a nice cool to the touch feel and it didn't sink in which Is good.We did decide to keep it, but I wouldn't use it as a primary. My back definitely feels better with my other mattress, but I would recommend this as an extra bed. As they say: "A Happy Wife Makes for a Happy Life." Primary bed. Great customer support (Answering all questions and concerns before ordering, meeting requested delivery date. No problem setting up as a single person with no helper (with handcart). No off-gassing/immediate expansion. Wife was immediately satisfied and continues to sleep very comfortably with no complaints. Initially it was somewhat firmer than I anticipated as a "side sleeper" but am sleeping well and getting comfortable with it. Survey Says: Our customers sleep better! Sleep academy: Sleep tips for a healthier family!